I'm currently loving Shiseido makeup and skincare on my skin! With this Asian beauty arsenal, I'm sure every Filipina can brave the metro's sweltering heat and still flash their best faces forward! So just imagine my delight when the brand announced a sampling campaign they're having! Recieve A Summer Skincare Set! Shiseido's newest memeber in the suncare department, the Perfect UV Protector SPF 50+, is getting a re-introduction to the Filipino market through the Half-A-Million Trial Users Campaign. The brand currently releases this very water resistant sunblock in Asia only. 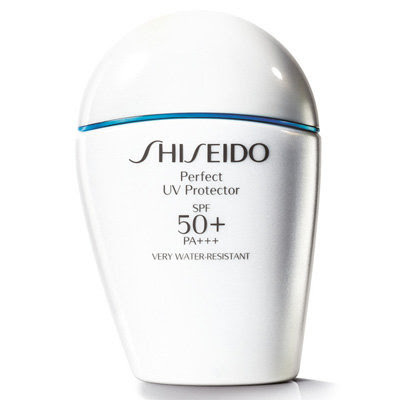 You can send your application to sample the Perfect UV Protector from today till mid-May, and Shiseido, through LuxAsia Philippines, will draw 800 entries who will receive a Summer Skincare Set by the end of May. Now don't ask me why only 800 applications are picked out when the campaign claims they're sending half-a-million kits! I'm only guessing there are more countries joining this campaign which will fully define the 'half-a-million' drift. I did a little research and I found out that Shiseido Asia website markets this as a body sunblock. However, Stylebible and Sukie have used this bottle on the face as well. Decide where to use it (and let me know!) when you get lucky enough to snag a kit, ok? I have used the White Lucent Day Moisturizer and the Brightening Balancing Softener in the past and I simply got wowed when Shiseido announced new White Lucent products coming out soon! They're giving out one million samples for the Intensive Spot-Targeting Serum and Anti-Dark Circles Eye Cream! The sad part is that I'm not so sure if these are still available because the promo started way back February 16 and is offered until supplies last. It's probably worth a try so print out your voucher or show an email confirmation to any Shiseido counter today! Note: all listed Shiseido promotions are available in the Philippines. I think my love for shiseido is growing after buying the perfect foundation brush and their sun protection stick foundation. Pass ako sa skin care, too expensive. But I think I'm getting their sunblock after I finish 2 of what I already have. Which means... next summer pa. The cream for dark circles can help you ensure that your eye area will stay as bright and clear as possible. Hi, A! Thanks for posting this ha? I got my Shiseido freebie na. Thanks for this awesome article. I know what product I will choose for my skin. Shiseido is a great makeup and cosmetic brand!